Also called Elizabethan or English Revival, the Tudor Revival takes its style from English Renaissance buildings of the 16 th and early 17 th centuries, including those of the Elizabethan (Elizabeth I, 1558-1603) and Jacobean (James I, 1603-25) periods. Some Tudor houses also mimic medieval cottages. While Tudor houses aimed for medieval and Renaissance overtones, they were always built with 20 th century materials and amenities. World War I sparked an interest in English and European buildings, and the Tudor style was enormously popular in the 1920s and 1930s, especially in the suburbs, and modified versions became fashionable again in the 1970s and 1980s. In Southern California, Tudor houses ranged from elaborate estate mansions to restrained suburban dwellings, but all were designed to create a cozy, homelike effect. An excellent example of a Tudor Revival residence in Fullerton is the Lamhofer House (1927) at 600 W. Valley View Drive. Another, more modest example of the style is located at 745 N. Euclid Street, constructed in 1928. 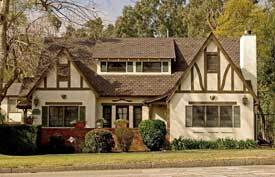 While Fullerton residents built a number of Tudor Revival homes, the preferred English style was the Cottage, a variant of the Tudor style that includes a picturesque plan but without the half-timbering. Bock, Gordon. "Inside the Tudor House: A Look at How Architects Derived Modern Interiors from Medieval Inspiration." Old House Journal December 2005: 62-67. Goff, Lee. 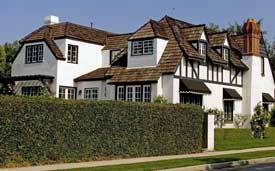 Tudor Style: Tudor Revival Houses in America from 1890 to the Present. New York: Universe, 2002. Pond, Catherine Seiberling. "Tudor Tutorial." Old House Interiors, November 2002: 68-73. Poore, Patricia. "American House Style: Tudor Revival." Old House Journal August 2000: 75+ (foldout). Walsh, Michael. Tudor Houses. Farmington Hills, MI: Home Planners, 1989.